Way back in March, we looked at the expected goals value of each lacrosse play, broken down by quarter. It was a follow on analysis to another post, which examined how the sequence of plays in a game can be used to estimate the number of goals that would be scored by both teams over the next minute of play. 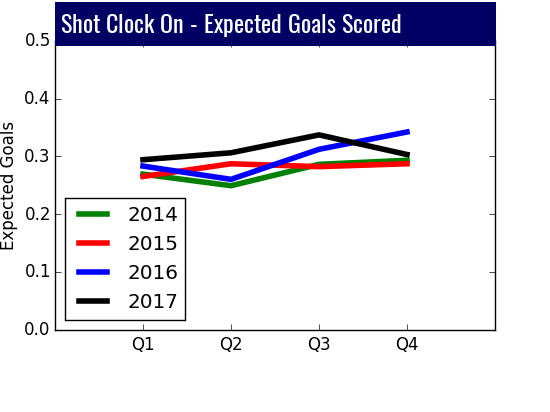 Now, it’s time for a refresh: our Updated Quarter Breakdown of Expected Goals by Play. The intent here is to more or less refresh our data from the beginning of this season. But we’ve also added 2014 games to our plays database, so this post will also incorporate those games as well. By refreshing, we can come to some conclusions about how the 2017 differed from previous years. Each season since the shot clock was introduced, the offenses have scored more goals after the timer was put on. 2017 was no exception. In fact, it was the high water mark so far. This trend is best exemplified if you look at the first quarter number in 2017: .294 expected goals. Essentially, this number means that within 60 seconds of a shot clock being put on, the offense is expected to score a goal on 29.4 out of 100 possessions. Remember also, that historically, success rates after a timer is assessed are higher in the second half. What was interesting about 2017 is that the first quarter expected goals number (remember, 1st quarters are traditionally worst in this metric), was higher than any quarter in 2014. While we did see a dip in 4th quarter expected goals relative to last year, 2017 set the record for expected goals scored after a timer on: .306 goals per instance. For reference, a 30% efficiency rate is roughly equivalent to a top 20 offense. As we’ve discussed before, the simple answer here is that offenses are adjusting to playing within the time constraint. And they are doing it at a faster rate than defenses can figure out how to use it to their advantage. For those interested in a permanent shot clock, it’s a useful data point when trying to understand how it would affect offenses and defenses. For the first time, 2017 saw a Tewaaraton finalist come from the FOGO ranks. Trevor Baptiste was the poster child for the position, and he played a huge role in getting the Pios to championship weekend. We also had the rise of TD Ierlan at Albany. And who could forget the out-of-nowhere performance of Jon Garino in Boston? Aside from these individual performances, this analysis points out another interesting trend that is heavily influenced by face-off dominance: the likelihood that a team who just scored will score again. In 2017, we saw an unprecedented rate of teams who had just scored putting another one in the back of the net. 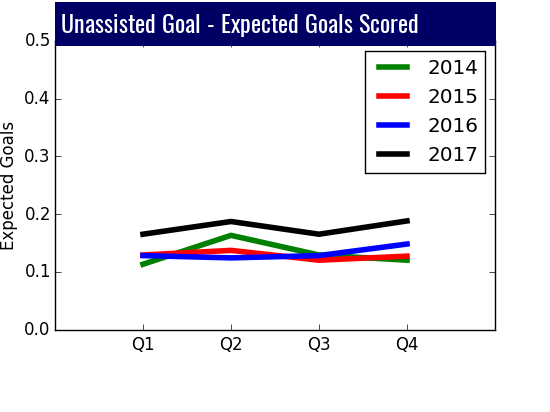 Whether you want to look at assisted goals or unassisted goals, the trend is clear. In 2017, for probably a variety of reasons, teams who had just scored were much more likely to score again within 60 seconds. For unassisted goals, the scoring team was 33% more likely to score within 60 seconds than in 2016 (.176 exp. goals vs .132 exp. goals). 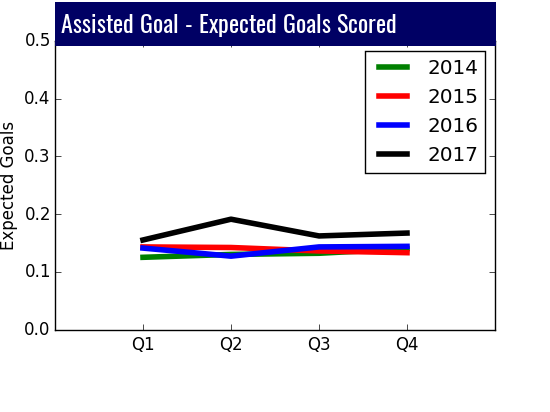 The increase for assisted goals was less dramatic but no less clear. If you are looking for evidence of the “fast-revolution”, maybe this is one. Apologies to the net-minders in our audience, but we have spent almost no time talking about keepers on this site. It’s not intentional, it’s just that it’s hard to do much with the old goal-to-save ratio. Perhaps next year, we can do more to highlight advanced goalie analytics! But as I was going through the play value charts for this post, the “Goalie Change” charts jumped out at me. I’ll be honest, I don’t think much about goalie changes. Generally, they happen when things are out-of-hand for the team making the switch. But the data shows that 2017 was an especially bad year for the strategy. The crux of it is that within the first 60 seconds after a change of keepers, teams gave up more goals this year than ever. And the shift was especially pronounced in the 2nd half. In previous years, a keeper brought on fresh to start the second half only gave up around .13 goals in their first minute of play. In 2017, that jumped all the way up to .20. For some reason, the 2nd half warm-up routine for new keepers didn’t help much. Not sure why that would be. And the trend persisted into the 4th quarter as well. 2017 was the worst year for backups goalies in the first 60 seconds of their appearance. Why this year would be any different than the previous 3 is a mystery. Did we have a dearth of quality backup goalies? Were teams not doing enough to keep their second net-minders fresh and ready to go? Is there a strategic change that they can make to ensure that their second option isn’t as much of a drop-off next year? 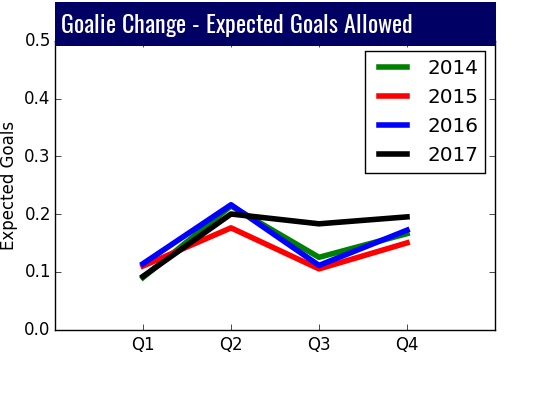 As I mentioned, we don’t generally think much about goalie changes. And it’s very likely that the final outcome of many games where they occur was no longer in doubt. But we always strive to highlight any sort of statistical anomaly, and this definitely qualifies.